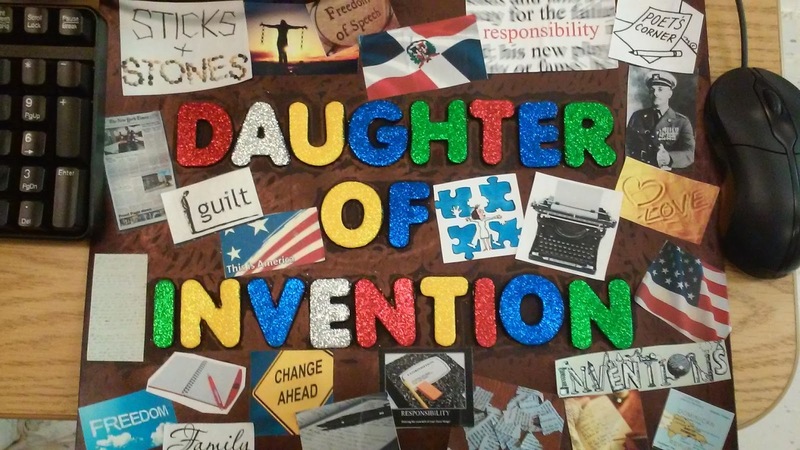 Daughter of Invention is a short story written by Hispanic American writer Julia Alvarez. Her family moved from the Dominican Republic to the USA. The story wasn't considered by the author as her biography but we can notice lots of similarities with the real life of Julia Alvarez. The story was being told by a 10-year-old girl who came with her family from the Dominican Republic to New York City. Her life in the USA was not easy. Her classmates teased her because of her bad English. Once she came back home and said to her mother that children threw stones at her. “Sticks and stones don't break bones ...” she replied. It was noticeable, however, that "it was as if one of those stones the kids had aimed at us had hit her." Her mother didn’t accept these complaints, she wanted her daughter to be more tolerant of the new society. She desired for daughter her to accept the new way of life in America - that is what mother wanted to say. "She wanted to invent something, my mother. There was a period after we arrived in this country, until five or so years later, when my mother was inventing." The hobby to make inventions was mentioned in the title of the story, so it is an important detail. "... we'd humor her. “What every household needs: a shower like a car wash, keys ticking like a bomb, luggage on a leash!” By now, as you can see, it'd become something of a family joke, our Thomas Edison Mami, our Benjamin Franklin Mom." The narrator was chosen to deliver a speech at a school assembly on Teacher's Day. It was a difficult task for the girl, she didn't feel comfortable with her English, she felt embarrassed speaking in public. The thoughts about this future event made her life for long weeks unbearable. A weekend before the Monday morning assembly she went into a panic. The mother tried to calm her down. She persuaded her daughter saying: “Just remember how Mister Lincoln couldn't think of anything to say at the Gettysburg, but then, Bang!". Everything would be ok if you relaxed. "Necessity is the daughter of invention. ",- she said. "That night, at last, I started to write, recklessly, three, five pages ... When I was done, I read over my words, and my eyes filled. I finally sounded like myself in English!" He snatched out of his daughter's hands the paper and tore it to small pieces. Daughter cried in indignation: "You're just another Chapita!" It took my father only a moment to register the hated nickname of our dictator, and he was after me. Down the halls, we raced, but I was quicker than he and made it to my room just in time to lock the door as my father threw his weight against it." “Go away,” I wailed, but we both knew I was glad she was there, and I needed only a moment's protest to save face before opening that door." That night mother wrote a new speech for her daughter "two brief pages of stale compliments and the polite commonplaces on teachers". This speech had a great success: "The nuns had been flattered, the audience had stood up and given “our devoted teachers a standing ovation,” what my mother had suggested they do at the end of my speech." As it became clear later, the last line was borrowed from her father’s old speech. Next day he bought a brand new electric typewriter - his daughter's dream. And for mother, as the author wrote: "her inventing days were over just as mine were starting up with my schoolwide success." The conflict in the story would be interpreted as a conflict between cultures of different countries or between generations. A possible interpretation of the moral could be explained as the attitude of each person towards other people, readiness to accept the traditions of a new country. - daughter started her long way as a writer.